Briggs and Stratton Lawn Mower Service Kit Suitable For Classic And Sprint..
Briggs & Stratton 400, 450 & 500 Series Engines. 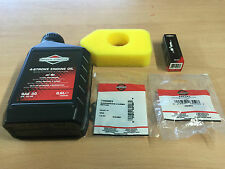 Genuine Briggs & Stratton 0.6Lt SAE30 Oil (100005E). Genuine Briggs & Stratton Air Filter (698369). 5 out of 5 stars - Briggs and Stratton Lawn Mower Service Kit Suitable For Classic And Sprint..
51 product ratings51 product ratings - Briggs and Stratton Lawn Mower Service Kit Suitable For Classic And Sprint.. 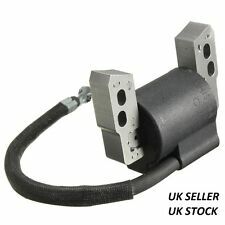 Type:MACHINETEC Ignition Coil. 1 x Ignition Coil. Two spring set 1 x governor 1X idle spring Govenor spring to suit the Briggs & Stratton CLASSIC and SPRINT engines. 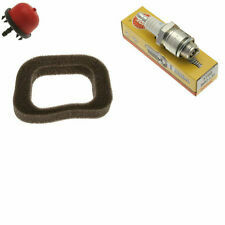 This service kit is suitable for Honda IZY petrol lawnmowers, fitted with the following engines. The above kit will fit the following models of IZY mowers. Genuine Honda 10W30 Engine Oil 600ml. 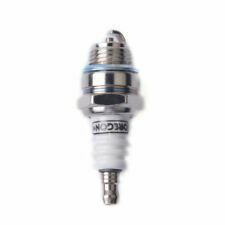 Genuine NGK Spark Plug. 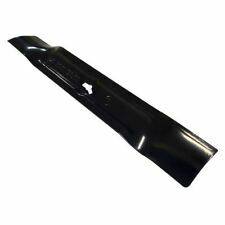 Quality Non Genuine Lawnmower Blade Suitable for the following Flymo 13" Models. Compact 330, Easi Glide 330, Easi Glide 330VX, Glider 330, Hover Compact 330. Part Number. Genuine Briggs & Stratton 4 stroke Engine Oil 100005 E. Tested and approved by Briggs & Stratton engineers. 0.6 litres (exact amount required for most walk behind lawnmowers). A high quality detergent oil classified SJ/CD by the API. GROUNDSMAN SAE30 ENGINE OIL IS A SUPERIOR QUALITY LUBRICANT PRODUCED SPECIFICALLY FOR HORIZONTAL 4 STROKE ENGINES. THIS INCLUDES LAWNMOWERS, GENERATORS AND STATIONARY ENGINES THAT REQUIRE A MONOGRADE OIL. Briggs and Stratton Lawn Mower Service Kit Suitable For Classic And Sprint. Briggs & Stratton 400 & 500 Series Engines. SUITABLE FOR THE FOLLOWING FLYMO LAWNMOWER MODELS LOCATE YOUR REQUIRED GRASS CUTTING LENGTH BY REMOVING OR ADDING THE SPACERS BETWEEN THE MOWERS BODY AND THE BLADE. TURBOLITE 330, 350, 400. TURBO COMPACT VISION 330, 350, 380. Service: 0208 390 4621. Spares: 0208 399 7449. Easi Glide 300VC. A quality non genuine lawnmower blade to fit the following Flymo models Easi Glide 300V. Easi Glide 300. Hover Compact 300. Micro Compact 300 (MC300). Micro Compact 300 Plus. Part Number. Genuine Briggs & Stratton Diaphgram & Gasket Kit (795083). Genuine Briggs and Stratton Lawn Mower Service Kit Suitable For Classic And Sprint Engines. Briggs & Stratton 400 & 500 Series Engines. Equivalent to B2LM, CJ8, RJ19LM, RJ17LM, RCJ8. Genuine Briggs and Stratton Spark Plug. Suitable For Briggs and Stratton Side Valve Engines Engines. Don't waste your money on inferior patent or copy parts buy genuine Briggs and Stratton spares and be assured of correct fit, operation and working life. 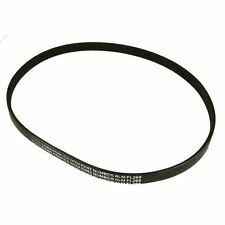 A quality non genuine drive belt to fit the following Flymo models Glide Master 340 (GM340). Glide Master 360 (GM360). Glide Master 380 (GM380). Turbo Compact Vision 330. Turbo Compact Vision 350. Briggs & Stratton Fuel Fit 250ml 992381. 250ml Fuel Fit treats up to 25 Litres of Unleaded Fuel. Use Briggs & Stratton Fuel Fit™ fuel stabilizer products to help keep your fuel fit for up to 3 years, promote quick starting, and clean the fuel system. Part no: 118550001. SOVEREIGN Petrol Lawnmower Fuel Tank Cap. This is a genuine GGP Spare Part that will fit many lawnmower makes Width: 23mm. Part No. 698369. Genuine Briggs and Stratton Air Filter. Don't waste your money on inferior patent or copy parts buy genuine Briggs and Stratton spares and be assured of correct fit, operation and working life. A quality plastic black ten litre fuel can. Suitable for petrol, diesel etc. The Small Print. Part Number. 1 X Genuine Briggs & Stratton Spark Plug. A quality non genuine lawnmower blade to fit the following Flymo models Turbo Compact 330 Vision. Vision Compact 330. Turbo Compact 330. Turbolite 330, Turbolite E330. NEW 7" FRONT WHEEL FOR A HAYTER HARRIER 41, 48 OR 56 MOWER. IT IS THE HARD PLASTIC VERSION AS FITTED TO THE CURRENT RANGE OF HARRIERS. Non-genuine sprint carburettor fits Briggs & Stratton Sprint Classic engines. HONDA HF1211. GXV340 GXV390. Genuine Honda Spare Parts are the Number 1 Choice when maintaining any Honda vehicle because. 16910-ZE8-015 - Fuel Filter. 17210-Z1E-801 - Air Filter. When using Genuine Honda. Replaces 495770. BRIGGS & STRATTON CARB DIAPHRAGM GASKET KIT. NB if it doesn't say GENUINE then it probably isn't - we are main agents for Briggs & Stratton. GENUINE BRIGGS PRODUCT. Fits Bosch 34GC, 34R and 3600H. 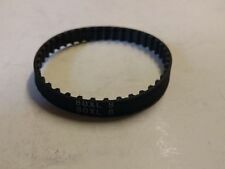 Equivelent to Bosch F016L65157, F016800271 & BQ341. PULL STARTER ROPE / CORD. Starter Pull Cord 4mm Thickness. 4MM THICKNESS. 100% NYLON ----. STONE CUTTERS. Stihl, Husqvarna, JCB, Mountfield, Westwood ,etc etc. RIDE ON MOWERS. PERFECT FOR,,. HOVERVAC 28, HOVERVAC 2800 (HV2800), HOVERVAC 30 (2006-), HOVERVAC DUAL HANDLE, HOVER VAC 280 (HV280). MOW N VAC 28. SUITABLE FOR THE FOLLOWING MODELS. Genuine Briggs & Stratton 4 stroke Engine Oil 100008E. Tested and approved by Briggs & Stratton engineers. A high quality detergent oil classified SJ/CD by the API. We promote a 'repair not replace' culture instead of a 'throwaway society'. 1.5mm Line size. Part number - EH503. Channel Islands: GE-JE. All Categories. Isle of Wight: PO30-PO41. Alderney, Herm & Sark: GY9. RECOIL / PULL STARTER IGNITION COIL CARBURETOR PLUG GASKETS FITS HONDA GX160 ENGINE /MOTOR. Taking pride in your lawn is something that can be time consuming but also very rewarding. The time you put in is mostly spent pushing a manual lawnmower, unless you have a ride-on mower. This essential piece of gardening machinery is so vital that you need to keep it performing at its peak all year round. To do so, you will need to think about parts and accessories for your mower. Manual Reel - With no motor or electronics, this is the most authentic way of cutting grass. While not emitting any pollution, manual reel mowers are also very quiet, cheap and safe. Fuel-Powered - As the name suggests, these mowers are powered by fuel, predominantly unleaded petrol. They boast power, versatility and, if well maintained, longevity. Electric - Powered by an engine, these mowers are usually plugged into the mains, but you can get wireless versions. Their main benefit is convenience, as in many cases you can simply plug them in and mow. To ensure your lawn mower runs effectively and efficiently, you may have to consider replacing vital parts. Unfortunately, not all lawnmowers can stay in perfect working condition for ever. Identifying a problem with your mower is not as straightforward as it would seem as there could be a number of reasons for your mower to develop a fault.